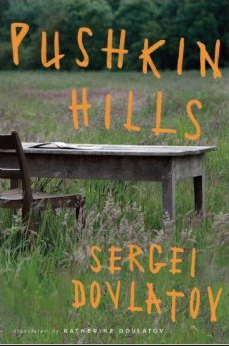 This is the first English translation of Sergei Dovlatov’s 1983 novel “Zapavednik,” which translates directly as “The Preserve” but is here is called Pushkin Hills, after the preserve in question, a trio of country estates associated with Pushkin, where Dovlatov worked as a tour guide prior to his exile from the Soviet Union. I find it to be the saddest, quietest and most personal of this great Russian dissident writer’s books, though still hilarious because every line of Dovlatov’s writing is hilarious. The story is that “Boris Alikhanov”—a stand-in for Dovlatov—an alcoholic and failed writer, gets a job at the Pushkin preserve after his wife has decided to emigrate to America, taking their young daughter with her. His wife has pressured him to join them, but he won’t. Everything in Dovlatov is between the lines, and here, between the lines, is the conflict between what it would mean for a great writer to leave his country, verses what it means for a great writer to stay in his country, when that country is the Soviet Union, where honest and free speech is not possible, and he is not allowed to write. For Dovlatov, it was an impasse. And so he drank. “I sat by the door. A waiter with tremendous felted sideburns materialized a minute later. The waiter, having had his fill of life’s diversity, said nothing. Sergei Dovlatov is a writer’s writer, one of the most sophisticated of the Russian prose stylists, and the book is a perfectly constructed puzzle-box on the themes of the inside and the outside, the personal and the public, the interior and the facade, the inmates and the asylum. Almost everything in this book can be turned on its head, and as soon as you look for a meaning, you find its opposite. It makes delicious sense that a book about a depressed man working in a ridiculous place, living among brutal, wife-beating, semi-literate peasants and ending with an alcoholic bender of epic proportions is actually a backwards-written love letter, to Russian literature, and to Dovlatov’s estranged wife. Dovlatov did eventually emigrate, and rejoined his wife and daughter, and it’s the daughter, Katherine Dovlatov, who translated this book. I plan to write more about the translation elsewhere, but it’s definitely the best I’ve read of this enormously precise, minimalist, hilarious, difficult-to-translate writer. There’s so much in Dovlatov that just can’t be funny without letting the texture of the Russian come through, and doing that while sounding smooth and correct in English is a true feat. I haven’t yet seen a translation walk that line as well as this one does. It’s a joy for all English-speaking readers, and makes a great introduction to one of the greatest Russian writers, as well as to the hilarious, dry, profane Russian humor.